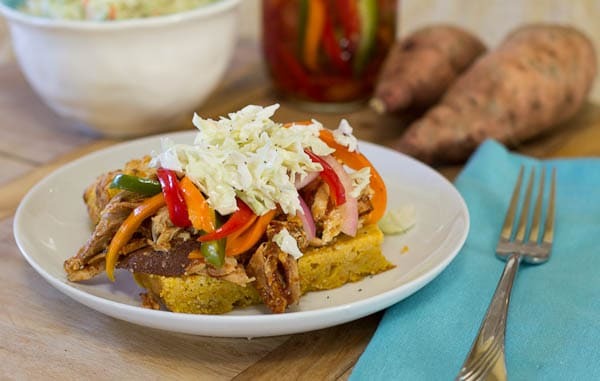 Slow-Cooked BBQ Chicken served on Sweet Potato Cornbread and topped with Pickled Peppers and Onions AND Coleslaw. Boy, that’s a mouthful! This recipe has a whole lot going on. It’s definitely a little bit of an involved recipe, but the end result is a huge quantity of food and you can use each individual component in several different meals. This was the first recipe that really jumped out at me in the new Southern Living The Official SEC Tailgating Cookbook . I ended up adapting the pulled chicken and coleslaw quite a bit to suit my preferences. There’s a whole bunch of flavor and contrast going on here. Sweetness from the cornbread, tangy spiciness from the pulled chicken, and a bunch of tang from the pickled peppers and onions, plus some crunch and creaminess from the slaw. Love the concept of the peppered peppers and onions. They definitely add a little something unexpected to this meal and would be fabulous added to a variety of different sandwiches. I thought the sweet potato cornbread tasted a little eggy, and it does have 5 eggs in it which seems like a lot of eggs for cornbread. I was going to redo the recipe using another sweet potato cornbread recipe, but both my husband and son remarked that they really liked it. So I thought maybe it was just me. For the coleslaw I used some Bourbon Honey from Cloister Honey. It is so much fun to cook with and really has a front and center bourbon taste. If you’re a bourbon lover, you have to get your hands on some of this stuff. One thing I picked up from this recipe that I really like is placing lemon slices on top of the uncooked chicken. As it slow cooks, the chicken really picks up an amazing lemon flavor. These sandwiches may be a little messy and complicated for tailgating, but they’re definitely perfect for having a bunch of friends over for game day. 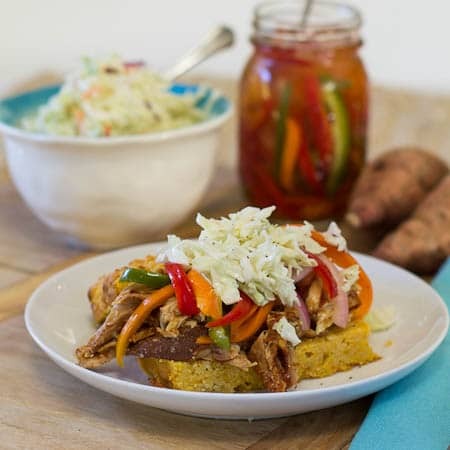 Slow-cooked BBQ Chicken served over sweet potato cornbread and topped with pickled peppers and onions and creamy coleslaw. It's one heck of a meal! In a small bowl, stir together first 6 ingredients. Place chicken in a slow cooker and sprinkle spice mixture on top of chicken. Whisk together Coke and next 5 ingredients in a medium bowl. Carefully pour mixture between chicken pieces so as to not wash the spice mixture off the chicken. Place a lemon slice on top of each piece of chicken. Cover and cook on HIGH 5 hours (or on LOW 6 1/2 to 7 1/2 hours). Remove chicken from slow cooker. Discard lemon slices, chicken skin, and chicken bones. Using 2 forks, shred chicken. Skim fat from sauce in slow cooker. Return chicken to sauce. For Pickled Peppers and Onions, Soak onions in ice water 10 minutes to remove some of their bite. Drain. Bring vinegar, sugar, salt, and red pepper flakes and 1 cup water to boil in a small saucepan. Stir occasionally to help dissolve the sugar. Place onions and peppers in a large Mason jar and pour hot vinegar mixture over them. Let stand uncovered on the counter for 1 hour. Cover and chill 24 hours. For the cornbread: Preheat oven to 425 degrees. Stir together first 4 ingredients in a large bowl. Make a well in center. In a medium bowl, whisk together eggs, mashed sweet potato, sour cream, and melted butter. Add into well in cornmeal mixture. Stir just until the cornmeal is moistened. Spoon batter into lightly greased 9-inch square pan. Bake 35 minutes, or until golden. For the Slaw: Whisk together all ingredients except coleslaw mix in a large bowl. Stir in coleslaw mix and chill at least 30 minutes. To assemble. cut cornbread into rectangles and then slice each piece. Top bottom half with pulled chicken, then pickled peppers and onions and coleslaw. The Pickled Peppers and Onions need to be made 24 hours in advance of serving. This entry was posted in Main Dishes, Slow Cooker and tagged chicken, crockpot recipes, poultry, slow cooker, sweet potato, sweet potatoes. Bookmark the permalink. Thank you for sharing this link Anna! I had no idea you could buy Marie Callender cornbread mix. I will have to order some. I’ve been seeing so many amazing things being done to cornbread lately! i never thought to do anything besides eat it plain (preferably hot out of the pan) before. This sounds so yummy! I can just imagine how much flavor and punch just one bite of this sandwich is packed with – looks incredibly tasty and totally worth the effort! Serving all of this on top of sweet potato cornbread is such an amazing idea! This does look involved, but it looks worth every minute to enjoy — especially as it will be around for a few days! I love the sound of sweet potato cornbread, too — gotta try that! Sweet potato cornbread is wonderful Marcie! You must try it! Looks delicious, especially the cornbread! I never thought about putting bbq on cornbread, it’s basically the greatest idea ever. I’m so hungry now! really like all the spices in this dish and the contrast in flavor and textures. Looks really great! I love slow cooker bbq chicken! My mom makes it 🙂 And I love corn bread… I make mine gluten free! Great idea of having them together! That list of ingredients oh WOW. Everything on that list sounds amazing, so I’m assuming that these sandwiches would be the best thing ever! You’re so sweet Consuelo! Hope you’ve had a great weekend and that you got some rest! oh my gosh, honestly, it’s like you post with me in mind. you always combine my very favourite flavours, and this is no exception! sweet potato? barbeque chicken? coleslaw?! honestly, stop. so impressed, as always! 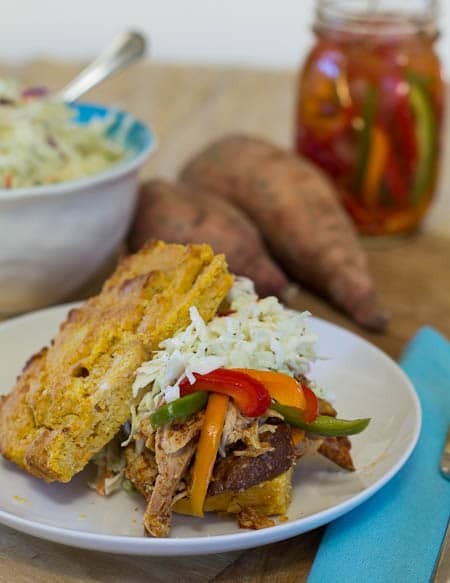 What a great idea to serve a sandwich on cornbread! All the flavors in this meal sound just about perfect to me! I do agree that 5 eggs sounds like a bit much though!